Pulmonary rehabilitation can dramatically improve COPD management and significantly improve COPD patients’ quality of life. COPD, a complex and often devastating disease, is characterized by progressive deterioration in lung function and exercise capacity. The GOLD guidelines define COPD as a “preventable and treatable disease with some significant extrapulmonary effects that may contribute to disease severity in individual patients. The pulmonary component is characterized by airflow limitation that is not fully reversible … and is usually progressive and associated with an abnormal inflammatory response…”1 Individuals living with the disease can experience devastating consequences from exacerbations and concomitant disease that impair quality of life due to dyspnea, psychological distress, and resultant social isolation. According to the US Department of Health and Human Services, there currently are 12 million people in this country with COPD, yet many more may have the disease and not know it.2 COPD is the third leading cause of death in this country, and the direct and indirect burden is tremendous. Considering the disease’s prevalence and enormity, current literature supports pulmonary rehabilitation as an integral component in the clinical management and health promotion for patients with COPD. Pulmonary rehabilitation is defined as an “evidence-based, multidisciplinary, and comprehensive intervention for patients with chronic respiratory diseases who are symptomatic and often have decreased daily life activities … designed to reduce symptoms, optimize functional status, increase participation, and reduce health care costs through stabilizing or reversing systemic manifestations of the disease.”3 Information from the National Emphysema Treatment Trial4 and evidence-based practice guidelines5,6 show notable benefits and positive outcomes of pulmonary rehabilitation. It can be instrumental in helping to achieve the goals of COPD management and overwhelmingly improve quality of life for this patient population. It behooves the health care professional to be cognizant of the benefits of pulmonary rehabilitation and the characteristics that make COPD patients candidates for it so that appropriate referrals can be made. Pulmonary rehabilitation programs utilize a multidisciplinary approach to deliver patient education, exercise training, and psychological support to patients with COPD. Clinical practice guidelines1,6 identify the following components that should be included in pulmonary rehabilitation programs: patient and family education; physician-prescribed exercise, including conditioning and strengthening exercises; psychosocial intervention that addresses the patient’s mental and emotional functioning; and outcomes assessment as it relates to the patient’s pulmonary rehabilitation goals. Patient education is a critical component of effective chronic disease management. Learning about the disease process, bronchial hygiene, control of dyspnea, proper use of medications, prevention and early treatment of infections and exacerbations, and exercise and modification of daily activities are just a few topics that will help facilitate the patient’s self-management and health promotion. Addressing the psychological aspect of chronic lung disease is imperative in improving overall quality of life. Psychological distress, namely anxiety, depression, and panic, in chronic lung disease is pervasive, and self-help strategies and psychological intervention and counseling can dramatically enhance well-being and social integration. The group support that occurs in a pulmonary rehabilitation program can profoundly affect how well a patient rallies and copes with the chronic disease. Pulmonary rehabilitation programs also can offer COPD patients the opportunity to practice the skills necessary for effective disease self-management. Pursed-lip breathing and dyspnea control, metered dose inhaler techniques, basic energy conservation principles, and stress management techniques are examples of skill sets that can be evaluated and reinforced throughout a program. Such skills are essential to achieving goals in long-term COPD management, such as minimizing symptoms, improving exercise tolerance and activities of daily living, preventing and treating infections and exacerbations, and enhancing overall quality of life. Other criteria for pulmonary rehabilitation include dyspnea that limits daily functioning, impaired exercise tolerance, nonadherence to the medical regimen, motivation to participate in and complete a pulmonary rehabilitation program, and increased use of health care resources, such as hospitalizations, emergency department visits, and physician visits. Additionally, pulmonary rehabilitation must be deemed “reasonable and medically necessary” beyond medical therapy for many insurance payers to cover the cost. Although a conventional pulmonary rehabilitation program may be ideal for patients with COPD, novel approaches are being considered to address rehabilitation needs in patients who may be unable to attend a structured program. 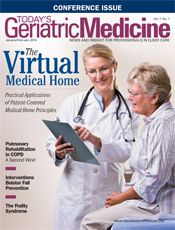 Home-based models of pulmonary rehabilitation using an individual’s television and home computer to interact with the health care team and others with COPD may be an option for some individuals. Education and group interaction can occur through videoconferencing, webcams, or Skype, for example.10 An exercise physiologist can interact in the same manner as the patient engages in exercise in the home setting. Pulmonary rehabilitation involving combination strategies also may be an option for some patients, combining one-on-one visits in an ambulatory setting with activity or exercise in the home setting. In this way, face-time visits may include education, monitoring, and follow-up, while exercise may be done independently in the home setting. Certainly each alternate approach for pulmonary rehabilitation has advantages and disadvantages that must be weighed on a case-by-case basis. Although diverse approaches to pulmonary rehabilitation may be the future trend, insurer guidelines for coverage must be determined. Medicare and most private insurance carriers may reimburse for pulmonary rehabilitation; however, specific guidelines for billing and reimbursement will vary depending on state regulations and individual carrier determinations.7 The rehabilitation team can assist both the patient and the referring provider regarding issues of billing and reimbursement. Health care professionals have a responsibility to ensure best practice in the treatment and management of patient conditions. Comprehensive management goes beyond medical therapy and must include education and interventions to optimize daily function and quality of life. Pulmonary rehabilitation, the standard of care in COPD, is the essential adjunct to medical therapy that will augment a patient’s function and quality of life. Through a multidisciplinary approach that addresses the comprehensive needs of COPD patients and tailors interventions to meet those needs, pulmonary rehabilitation is instrumental in maximizing function and well-being. In promoting patient advocacy, health care professionals need to take an active role in referring patients to pulmonary rehabilitation programs when such programs are available. Once a COPD patient has been diagnosed, treated, and becomes stabilized on medical therapy, providing a prescription for pulmonary rehabilitation should become part of best practice across all care settings. If there are no pulmonary rehabilitation programs readily available in a provider’s network or geographic locale, then utilizing strategies to incorporate the components of pulmonary rehabilitation, including education, exercise, and support, should be sought as minimal requirements for best practice in COPD care. In this way, health care professionals truly can offer COPD patients a second wind for living with their chronic disease. — Debra Sanders, PhD, RN, GCNS-BC, is an assistant professor of nursing at Bloomsburg University of Pennsylvania and a board-certified gerontologic clinical nurse specialist. Who Are Pulmonary Rehabilitation Candidates? • increased use of medical resources such as hospitalizations, emergency department visits, and physician visits. Patients who have comorbidities contraindicating rehabilitation or a cognitive disorder limiting ability to participate would not be candidates for pulmonary rehabilitation. 1. Global Initiative for Chronic Obstructive Lung Disease. Global Strategy for the Diagnosis, Management, and Prevention of Chronic Obstructive Pulmonary Disease (Updated 2013). http://www.goldcopd.org/uploads/users/files/GOLD_Report_2013_Feb20.pdf. February 2013. Accessed December 1, 2013. 2. Take the first step to breathing better. Learn more about COPD. National Heart, Lung, and Blood Institute website. http://www.nhlbi.nih.gov/health/public/lung/copd/index.htm. 3. Nici L, Donner C, Wouters E, et al. American Thoracic Society/European Respiratory Society statement on pulmonary rehabilitation. Am J Respir Crit Care Med. 2006;173(12):1390-1413. 4. National Emphysema Treatment Trial (NETT): evaluation of lung volume reduction surgery for emphysema. National Heart, Lung, and Blood Institute website. http://www.nhlbi.nih.gov/health/prof/lung/nett. May 20, 2003. Accessed December 7, 2013. 5. Ries AL, Bauldoff GS, Carlin BW, et al. Pulmonary rehabilitation: joint AACP/AACVPR evidence-based clinical practice guidelines. Chest. 2007;131(5 Suppl):4S-42S. 6. American Association of Cardiovascular and Pulmonary Rehabilitation. Guidelines for Pulmonary Rehabilitation Programs. 4th ed. Champaign, IL: Human Kinetics; 2010. 7. Birnbaum S. Pulmonary rehabilitation: a classic tune with a new beat, but is anyone listening? Chest. 2011;139(6):1498-1502. 8. Steele BG, Belza B, Cain KC, et al. A randomized clinical trial of an activity and exercise adherence intervention in chronic pulmonary disease. Arch Phys Med Rehabil. 2008;89(3):404-412. 9. Scott AS, Baltzan MA, Fox J, Wolkove N. Success in pulmonary rehabilitation in patients with chronic obstructive pulmonary disease. Can Respir J. 2010;17(5):219-223. 10. Burkow TM, Vognild LK, Østengen G, et al. Internet-enabled pulmonary rehabilitation and diabetes education in group settings at home: a preliminary study of patient acceptability. BMC Med Inform Decis Mak. 2013;13(33).